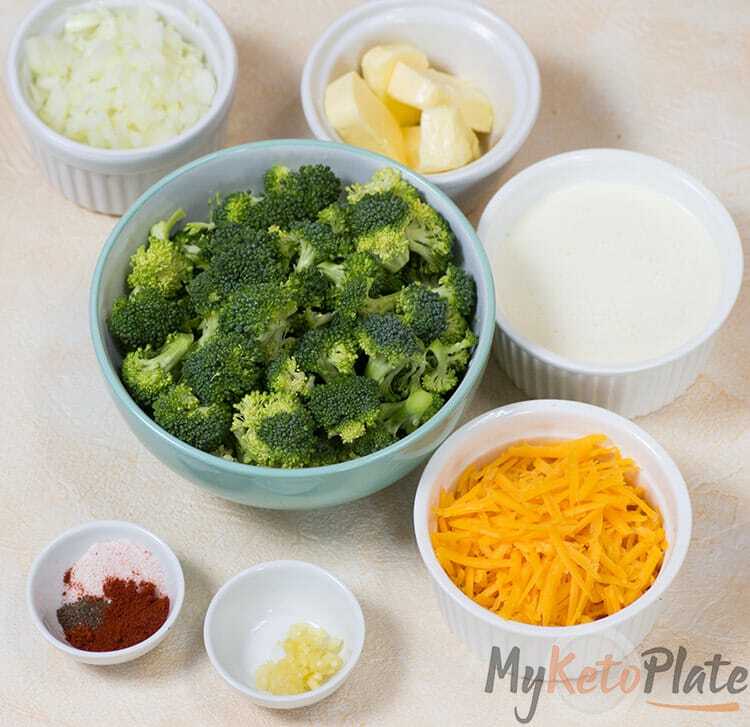 This keto broccoli cheddar soup packs tons of flavor without all the hidden carbs, it’s filling and creamy. Fall is coming, so it’s time to warm our souls with a delicious keto soup. I am always excited for fall recipes because I love cold weather and delicious pumpkin recipes. I am going to fill My Keto Plate site with tons of my favorite soul-warming recipes, keto-fied. Let’s start with one of my most favorite of them all, super simple recipes that need only a few low carb ingredients. 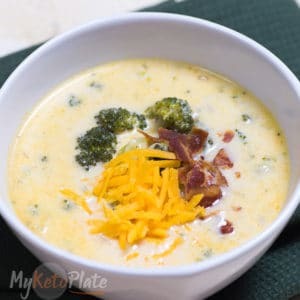 How to make keto broccoli cheddar soup? The soup is creamy, tasty and filling. What I want to be clear about is that this soup has a thinner consistency because I didn’t use any thickener agent. The taste is fantastic but if you want a thick soup to use something like xanthan gum, psyllium husk powder, guar gum or coconut flour to improve the texture. Being on keto, I learned that I have to eat foods that allow me to feel better, to have more energy instead of fueling my body with carbs that leave me feeling tired. Most of the recipes are great because the high-fat content contributes a lot to the taste. Imagine that this soup has heavy whipping cream, cheddar cheese and you’ll serve it with crispy bacon bits and more cheese on top. Keto Broccoli Cheddar Soup is one of those recipes that I can’t stop making because everyone in my family absolutely loves it. The secret is to use high-quality ingredients. Shred your cheddar cheese and don’t use the cheapest brand you can find. It lacks flavor. I’m a firm believer that while eating high fat low carb is good for you it will never taste the same as the high carb versions. The serving size of the soup that in my opinion is more than enough if it seems little it’s one cup that comes with 33 grams of fat. 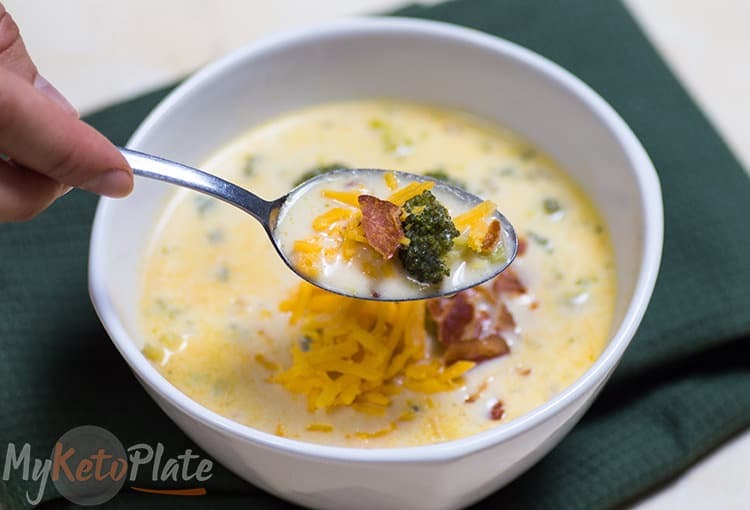 This keto broccoli cheddar soup is made with cheddar. It's creamy and full of flavor. Eating one bowl of this filling keto soup warms my soul every time. Ready in under 25 minutes it's perfect for a quick delicious lunch or dinner. In a large pot, add the butter and let it melt. Sautee the onions in butter for 2-3 minutes on medium high heat then add the garlic and let it cook for about 30 seconds. Add the broccoli in the butter and onion sauce and stir a few times. Pour in the 5 cups of broth and let it simmer for about 10 minutes or until the broccoli is tender. Reduce the heat and add the heavy whipping cream. Let it boil for another two minutes. Turn off the heat and add the cheddar cheese continually stirring until the cheese melts and it's well incorporated. Grate your cheese as the one that is pre-shredded may not melt well. Transfer the keto cheddar broccoli soup to bowls and serve hot with shredded cheese and bacon pieces on top. Tried this recipe?Mention @MyketoPlate_ or tag #myketoplate! One of my favorite recipes for fall. Some tweaks made but delicious. Hi there. As a vegetarian I am looking for keto soups. I thought this was vegetarian but you list chicken stock and also bacon as part of the ingredients. This is misleading and I’m disappointed I can’t use this recipe. You can skip the bacon and add smoked paprika!